The 2600 duo in Friedrichstadt, the SZ in Dorridge, and the decaying Fadesa Romeo van on the road into Fornells spring immediately to mind.This Montreal was spotted on an unremarkable suburban street in Basel in March 2008. I imagine that the massive rise in classic car prices would make such encounters far less likely now. The Montreal was one of the fabulous crop of new cars at the 1970 Geneva Salon; Porsche 917 (nominally a road car), Range Rover, Citroën SM, Triumph Stag. They couldn’t have come at a worse time, as geo-political tensions would make the flaunting of wealth, even in a tasteful manner, a risky activity. Unlike the others, the Alfa’s shape was familiar, as Marcello Gandini at Bertone’s show car at the Italian pavilion at the 1967 Montreal Expo. That car was a re-bodied Giulia Sprint GT. Three years on, the production version borrowed many parts from its 1750GT Veloce successor, but used a version of the 33 Stradale’s four camshaft V8 adapted to suit a grand tourer. Capacity was increased from 2.0 to 2.6 litres, a cross-plane crankshaft replaced the 33’s flat-plane component. SPICA fuel injection featured on both. The power output was around 200bhp (DIN), highly tuned for a 2.6 at the time. Despite the racing heritage of the high-revving power unit, The Alfa was not particularly well received. Contemporary reports suggest that the 1750GTV-derived chassis was not up to the power of the V8. Perhaps it was simply too ordinary for a car priced within tantalising range of the Dino, Uracco, and Merak. Going by September 1974 prices, a Montreal cost £6085. An SM cost £6679, for which one could buy two Range Rovers. A Dino 308 GT4 was priced at £8340. 3900 Montreals were built in the course of a seven year production life. Alfa’s targets were not revealed, but there’s no doubt that the project objective was to produce a glamorous high-end flagship, rather than an all-rounder like the 2600 Sprint. I doubt if I will ever drive a Montreal, so I can only judge it as a piece of sculpture. I was captivated by the pictures in 1970, 38 years later, on a Swiss suburban street it still looked just as good. Stunning car without compromise. Judging by this https://petrolicious.com/films/this-alfa-romeo-montreal-plays-with-light it’s not too shoddy to drive either. I do like the Montreal. But, the problem for me is that all of the changes from the concept car are for the worse, even if only marginally. I know, I know, production realities and all that. But on the other hand, this is an Italian concept, realised by a profoundly un-practical Italian carmaker in the 1970s, before legislation was a serious influence on design considerations, especially in the case of an expensive, low-volume GT. The reality is that the detailing on the concept is lovely, especially around the front end; somehow, the production version loses the delicacy and not a bit of the charm. On the other hand, it could be worse – witness the butchering endured by the concept Brera on its tortured route to production. Bizarre factoid – there is, for some reason, a disproportionately high number of Montreals in Oz (as told to me by a Montreal fanatic). Not entirely sure why (will need to follow up on that one), but can verify – it’s not at all unusual to see four or five lined up in a row at any given Italian classic show there, which is pretty much unheard of in any European context. Relatedly – Unos that clean must be approaching rarity on par with the subject car. Stradale – I don’t think I could get on with that ‘wrong way round’ quarter-light on the show car. The production version is a bit bulkier, but not disagreeably so. It occurred to me that the shape would translate perfectly to modern production methods and crashworthiness expectations, with the front and rear ends in deformable plastics., and that heavy B-pillar build up. 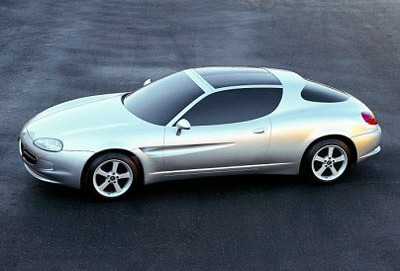 Was the 1995 Daewoo Bucrane a second shot by Italdesign? The number of Australian Montreals interests me. Were the cars sold in Australia new, or second-hand imports? It seems that only 155 RHD Montreals were made, and the Australian authorities have a tremendous aversion to LHD cars being used on their roads unless they have demonstrable historic significance. Perhaps Alfa spotted a sweet spot in the roller-coaster Australian economy. Europe was having a bloody rough time in the 1970s, and Alfa thought better of even trying to adapt the racing car engine to meet US and Canadian emissions standards. I have sat in a Montreal and, had I been persistent, I might well have been able to drive it. Except probably not. Whereas I have been able to find enough room in even a Caterham to accommodate my length and still leave room to operate the controls, the Montreal was incredibly restricting. Even its owner, of average height, volunteered that he found it cramped. I once did sit in a Montreal. I think I wrote about the ashtray. It might have been the only one I’ve ever seen in the metal. It was featured in a Danish classic car magazine and might be one of one in Denmark. I’d imagine running a 1965 Ferrari would be an easier hobby. Is it not true that the Monty didn’t fare that well in terms of sales or verdicts? I seem to recall that despite the show-car looks it didn’t smack bells when launched. This is on the Lottery short list. Even if it is a dud to drive I can then just pull up a chair and look at it. Elegant car with stunning details, but not one of the cars of my dream cars list. I am afraid i never saw one of them on the road, the one i saw in a classic car exhibition looks pretty small. It has nearly the same dimensions as a Mazda MX-3 for example…. No, Markus: it doesn’t make my list either. It’s not because it’s not pretty. I don’t mind the size. Is it wrong to say I’d rather a GTV6? Is that apples and oranges? Or I’d like a Lancia Fulvia Zagato. The ‘treal is too Ferrari for me, which is also a compliment. Don’t they all look small today? I don’t mind that, either – it’s rather the other way round. Interesting that you mention the GTV, Richard. It’s one of my childhood favourites and much more an object of desire than the Montreal. I don’t know if this is because I know the GTV better (have I ever seen a Montreal? I can’t remember) or if my sense of practicality is just too strong.